The strain on the faces of the players told the story. From Captain Stephen Appiah to those who didn't get selection into the first eighteen, the magnitude of the loss was not lost on anyone. Hearts of Oak defender Daniel Coleman attempted to lighten the mood by asking when he will get another opportunity to earn $3,000 in winning bonus but the implications of the loss was much more serious than that. Not for the first time, Ghana had faltered in its opening world cup qualifier. In the past it had been Burundi, Gabon and then Liberia who had ensured that day one and subsequently the qualifiers was miserable for Ghana. As Burkina added their name to that list, the Ghanaian players looked incredibly miserable it was even difficult getting a word out of them. Defender Sammy Kufuor, Ghana's best player on the day lay down in pains as his colleagues made their way to the dressing room. Coach Mariano Barreto politely brushed aside interview request in the few minutes after the match whilst travelling Ghanaian journalists and fans engaged in their own small meetings about what might have gone wrong on the day. After attending to his injured players, Barreto attempted to answer that question. Inevitably, he went back to his complaints in the run up to the game about how poor preparations were and the three days of serious training that the team had. "Burkina spent several weeks camping but we came together for only three days and paid for that," Barreto said. But the Portuguese was far from dispirited. "This is only the first game, the Burkinabes made the most of our one mistake and scored but there are several games ahead of us. I hope this teaches everyone a lesson in Ghana which is that we must prepare for games like this very well." The match at the end of the day boiled down to who could run and work for ninety minutes. In essence, it was the Burkinabes who benefited more from never getting tired. In the opening minutes, it was as though Ghana will run away comfortable winners. Michael Essien, Stephen Appiah and Sule Muntari were getting the better of the exchanges. During that period Appiah's fine shot even came off against the cross bar. But once the Bukinabes settled, there was no stopping them, especially in the second half. You sense whatever their coach told them went down really well. Mummuni Dagano started creating problems for the Stars defence particularly getting towards the end of the first half. Twice, he controlled the ball on his chest with some mastery and let fly two wonderful shots that just missed the goal slightly. In the first fifteen minutes of the second half, the Burkinabes played as though their whole lives depended on a win. Yet until the 80th minute when Mamadou Zongo rose to meet a header from the right, it didn't look as though they will get it. But they got and that ruined another world cup start for Ghana. It also triggered off the usual passionate debate that comes with losses in international matches for Ghana. Within minutes of the final whistle, questions were flying and most of them directed at coach Mariano Barreto. Why was Charles Taylor relegated to the stands? It was the most pertinent question. The Kotoko man has proved he can do a decent job against any team and watching Ghana struggle without him for ninety minutes made the loss even more painful. But don't expect this result to trigger off any major changes. You sense Barreto will be desperately looking for an out and out striker which Ghana did not have on the day but he is insistent that he won't chop off too many players from the squad. If he does find one, expect the likes of Ablade Morgan, Nana Arhin Duah and Lawrence Adjei to be the culprits. Barreto might also have noticed how his captain a few times chose style over substance to the detriment of the team. 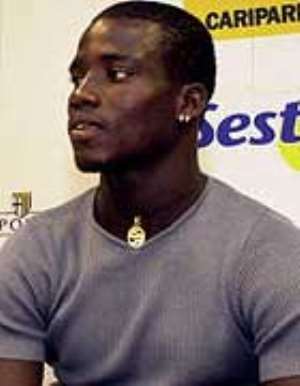 Stephen Appiah mostly always does a good job for Ghana but Saturday was a sad deviation from the norm. You can't say that about Samuel Osei Kufuor. The Bayern Munich man was outstanding yet again for Ghana. He won almost every challenge and even when he dislocated his shoulder, insisted on playing with his left shoulder strapped to his body. So impressed was Barreto he called him my natural leader and a model for Ghanaian footballers. The Bayern man and his mates including captain Stephen Appiah are promising a better display in Kumasi against South Africa. It is inevitable if Ghana is to make any meaningful impact in the qualifiers. GFA chairman Dr. Nyaho Tamakloe is adamant Ghana will make an impact and qualify for the world cup. In the past defeats like the one to Burkina Faso have triggered all sorts of changes but Nyaho says he won't allow that to happen because he finds the current crop of players and officials good enough. And that is true. Whilst this was a false and bad start, it will be insane to make wholesale changes as we have done in the past. A few though might do.